¡Agregaste a Lila Downs a tus favoritos! Te avisaremos antes que los boletos salgan a la venta en tu región. 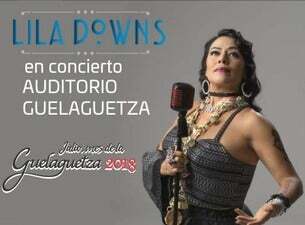 ¡Obtén alertas vía correo electrónico y nunca más te pierdas los eventos de Lila Downs! Lila Downs is the daughter of a Mixtec Indian woman, Anastasia Sanchez, who ran away from her village at 19 to sing in Mexico City cantinas and a Minnesota-born, Scottish-American film & photography professor, Allen Downs, who saw her singing and fell in love. Lila Downs was born in the Oaxacan mountain town of Tlaxiaco, 7,000 feet up in the heavens. The first songs she remembers are her mother singing Lola Beltrán's heartfelt rancheras, and her father singing Woody Guthrie's ''This Land Is Your Land.'' Her border-blurring, multicultural upbringing infused Downs with a firm world view in support of the disenfranchised working classes and an aesthetic vision that embraces cross-cultural pollinations. As a result Downs has become one of the most innovative exponents of Mesoamerican music on both sides of the border. Her lyrics are high-minded and sentient and her sound is all encompassing. By drawing on a pan-Latin palette of music as well as American folk, jazz, blues and rock, Downs and her worldly band of kindred spirits, La Misteriosa, have won accolades and a devoted following of world music fans. Known for her smoky voice and magnetic performances, Downs has created a unique body of work that defies categorization in any single genre. With eight studio albums and one live album released since 1999, Lila Downs has long been recognized by the music industry. She received a Latin Grammy for the 2004 release “Una Sangre,” and a Grammy nomination for 2008’s “Shake Away,” as well as various performance awards from around the world. Her 2011 release, "Pecados y Milagros" garnered both a Latin Grammy for Best Folk Album, and a Grammy for Best Regional Mexican Music Album. It also hit #1 on the Mexican music charts immediately after its initial release, and reached Double Platinum status there. In addition to headlining venues all over the world, Lila Downs has performed at major festivals and events including WOMAD; Live Earth; Montreal Jazz Festival, San Francisco Jazz Festival, the World Sacred Music Festival - appearing with such luminaries as the Dalai Lama; the Latino Inaugural Ball for President Barack Obama, the Bicentenario de Mexico, the opening ceremonies for the 2011 Pan American Games, and the 2012 Latin Grammys on Univision. ¿A qué evento de Lila Downs asistirás?